Pretty! Now I'm wondering what you'll do with it. Some of it's going into the corset, but there's going to be quite a lot left over. Got any ideas? Based on the sleeves, yup, a woman's kimono. I like the paper/cardstock geodetic constructs! 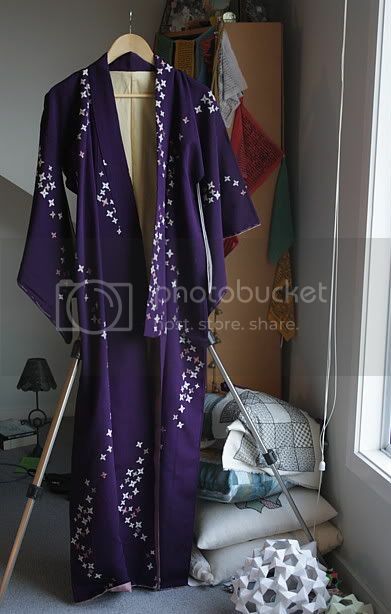 I've a few old kimono around here I should either recycle or re-sew. Heh. Both the modular origami and the cushions have featured in earlier photos. I would wear it as it is! It's beautiful! I was tempted, but it was a bit small, and I am frankly just the wrong shape for kimono. Wear it open, over something else?